Every October the route of the Tour de France is announced under great fanfare. The race organizers provide maps and glossy videos and make sure the correct pro riders are present standing on a stage with a fancy backdrop. Hype and suspense pre race seem as much fun as knowing who won. The camera pans over the nervous faces of the riders in the audience at the Tour announcement, it is tradition, and yet this year the theme for 2015 is "breaking away from tradition." Recreating anew the grandest of the Grand Tour races will be great fun to watch. In 2015 you will be taken to new places and new heights. You will be entertained by a team time trial. You will witness the Tour de France riding over cobbles and see new climbs never before visited. That is if the pro riders make it through the tricky and treacherous first week (the exact descriptive words of Vincenzo Nibali). You will also see impeccably selected teams, for the parcours of this Tour de France will require many well seasoned all-rounders and several very good climbers in top form. And, of course, the fastest sprinters in the world. It won't be until July when we will truly know who will be racing the 2015 Tour de France. But that won't stop us from planning which stages to get most excited about and discussing who will win. As you probably read, the big million dollar trifecta challenge to Froome, Contador, Nibali, and Quintana, to race all three Grand Tours, fell apart and word is that Chris Froome might not even race in the 2015 TDF. Froome was not present at today's route announcement in Paris, France. Neither was Bradley Wiggins (I knew you'd ask that). 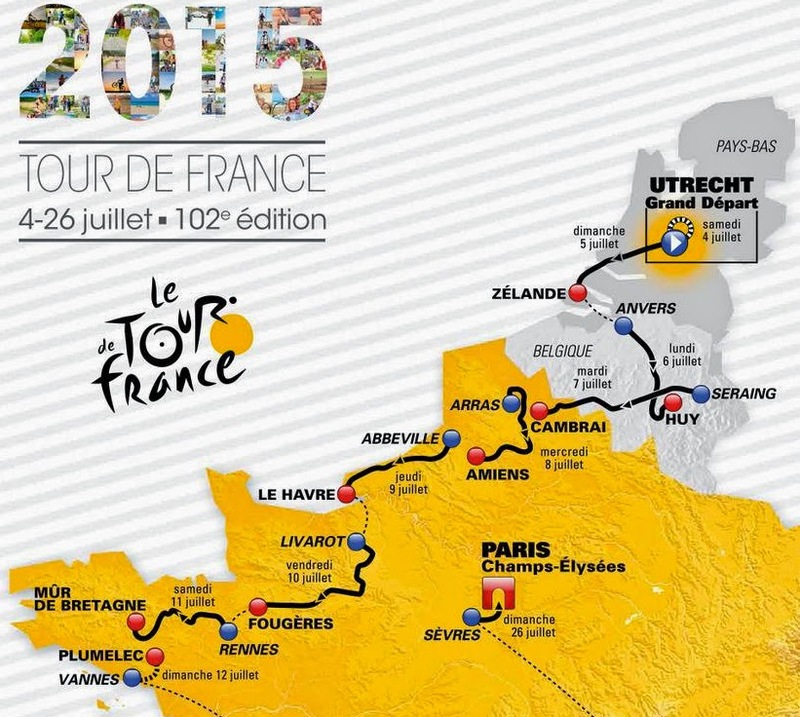 This will be the 102nd edition Tour de France. This year's stats to recite are: 21 stages, 21 teams, 3344km, 9 flat stages, 7 mountain stages, 5 summit finishes, 1 ITT, 1 TTT, cobbles on Stage 4. The start will be in Utrecht; the final big stage finish on Alpe d'Huez before the parade stage into Paris on the final day. 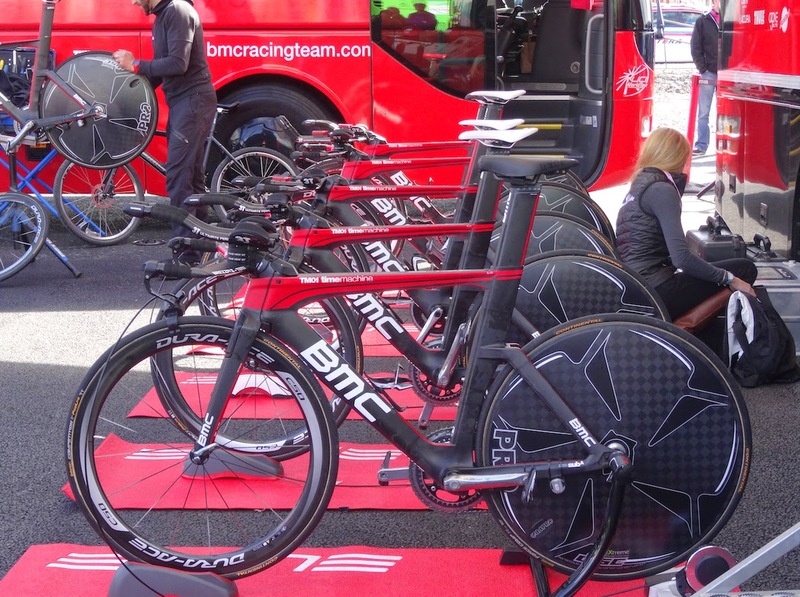 Placement of a TTT in week two breaks a UCI rule and is another sign of the power and might of race organizer A.S.O. There will be an ITT on day one; The Netherlands, Belgium, cobbles plus a TTT in week one; Pyrenees in week two; Alps and Paris in week three. A new points classification system will be initiated in 2015 (see new rules below). Time bonuses on each stage are back for 2015 (last applied in 2008), with 10, 6 and 4 seconds to be awarded for the top three stage finishers. 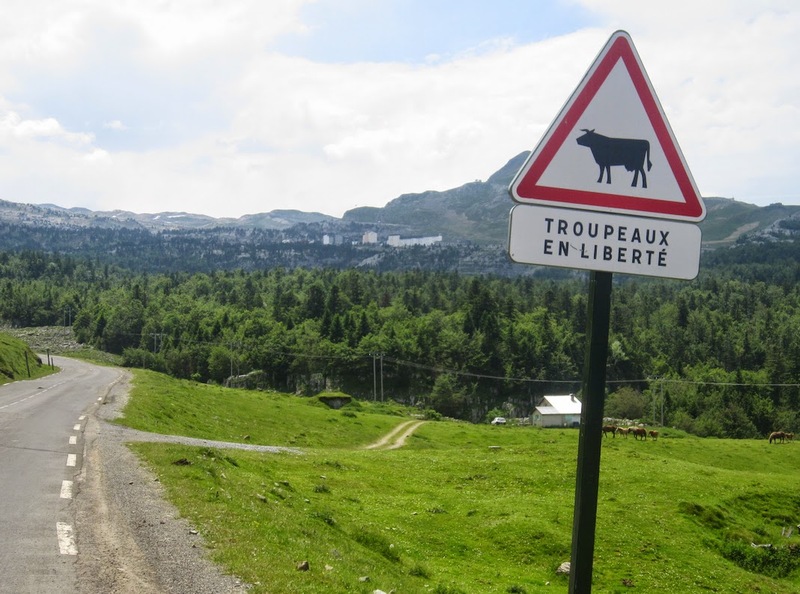 You will hear talk of Pra-Loup, the climb which ended Eddy Merck's chances of winning the 1975 TDF. This is the 40th anniversary of the introduction of the polka-dot jersey into the race. This is not the year of the solo time trialist. In a TTT the fifth man crossing the line must be within 25 percent of the winning team's time. The route is planned to engage TV viewers throughout the three-week Tour. We could see the yellow jersey changing hands for the first ten stages. Tactically the narrow roads, winds, crowds, risk of falls, plus added time bonuses run head first into the ability for a team to keep their GC man in the front of the pack, plus a full squad of riders fresh and healthy for a team time trial on Stage 9. If the Directeur Sportifs and Team Managers can achieve that feat after nine days of racing then they will be poised to unleash the climbers. 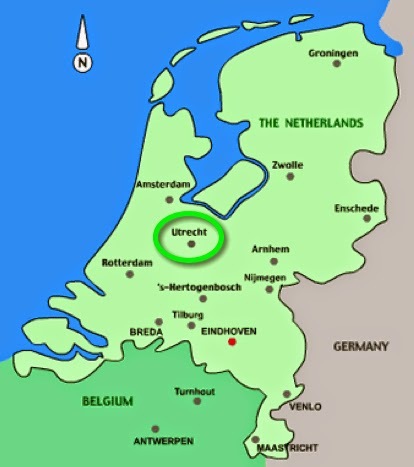 The last time the Tour started in The Netherlands was in 2010. If you are a true groupie of Pro Cycling - arrive days early to spot your favorite riders in the city or attend the Team Presentation. Stage 1 will feature a short 14km Individual Time Trial (not referred to as a prologue). There are no other ITTs in the 2015 race. Stage 2 and 3 cover new territory for the TDF, crisscrossing Belgium, which should make for good TV coverage and new exposure for Tour fans to small cities in Belgium (some of these roads and climbs are used in other Classics races). I highly recommend being a cycling tourist in Belgium - the country knows and lives cycling. 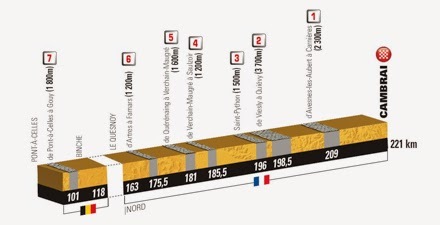 Stage 4 contains seven cobbled sections (secteur pavé) sometimes featured in Paris-Roubaix. All that discussion last year about the cobbles having no place in the TDF fell on deaf ears, the fact remains - the cobbles made for very exciting racing. Stage 4, 5, 6, 7, 8, and 9 are all in northwestern France, which means close proximity to the UK, Belgium, The Netherlands, Luxembourg and Germany - so expect enormous crowds for the first week. Stage 5, 6, and 7 are all flat stages. Marcel Kittel fans - line up. Both Kittel and Cavendish claim their goal is to stick with it all the way into Paris. Fabian Cancellara would excel in the earlier stages but will he stick around past Stage 9, based on previous years - no. Anyone interested in WWI history and really good Belgium beer, chocolates and cobbles will be interested in being a tourist near Stages 3, 4, and 5. 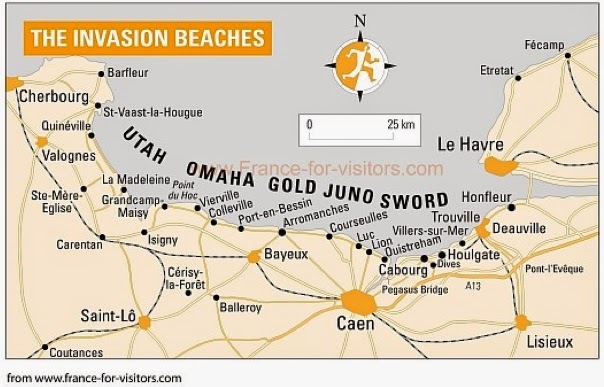 Anyone interested in WWII history, being a tourist in Brittany, Normandy or seeing Mont-Sainte-Michelle will be interested in traveling near Stages 5, 6, 7, 8 and 9. You should be able to base yourself in two locations and drive to the stages, enjoying days of tourism before or after. Rest Day #1 happens after nine days of hard racing with a long transfer to Pau in the Pyrenees. 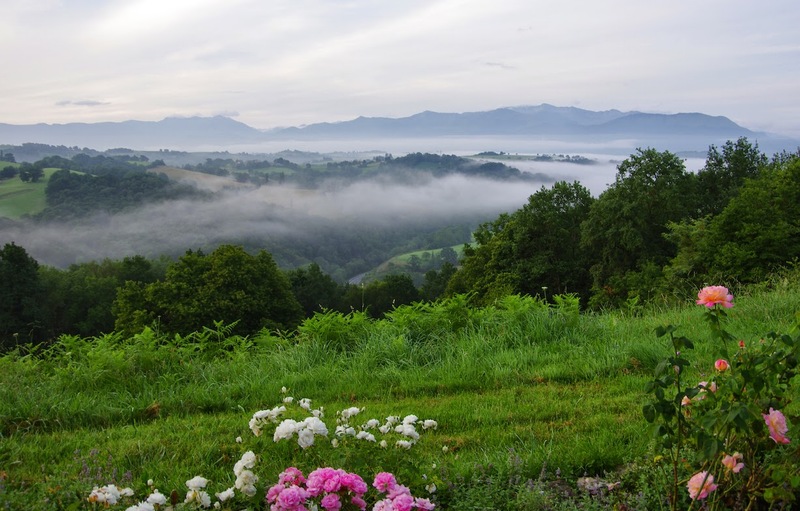 Base yourself in the foothills of Midi-Pyrenees and you will be able to drive/ride to two or three stages. 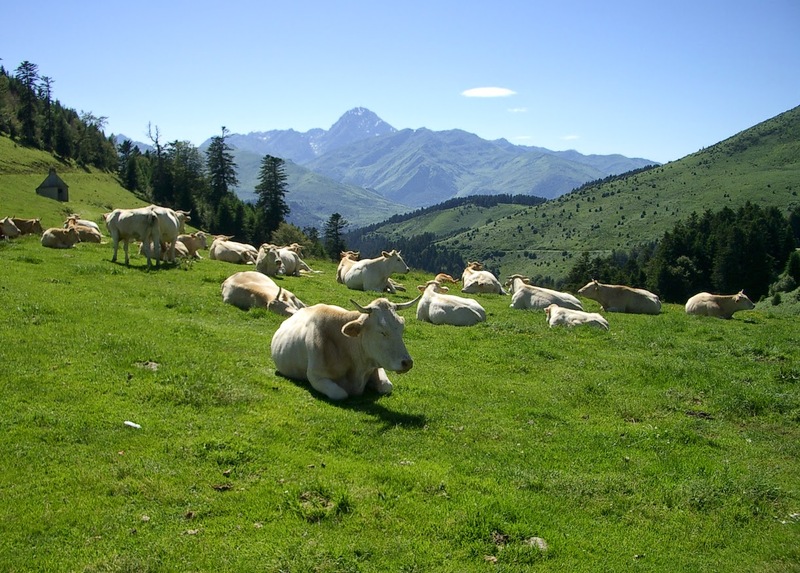 For more information on all things Pyrenees, read: VeloPeloton. Pau is a city often used for TDF rest days. The surrounding area happens to be some of the best do-it-yourself bike riding in France, and honestly quite fun to see the teams out riding on the local roads (Pau to Gan or Nay). Also be sure to leave time to ride the climbs not in this year's TDF (Cycling Challenge offers a map of Climbs in the Pyrenees, or my personal map of my favorite climbs is below. 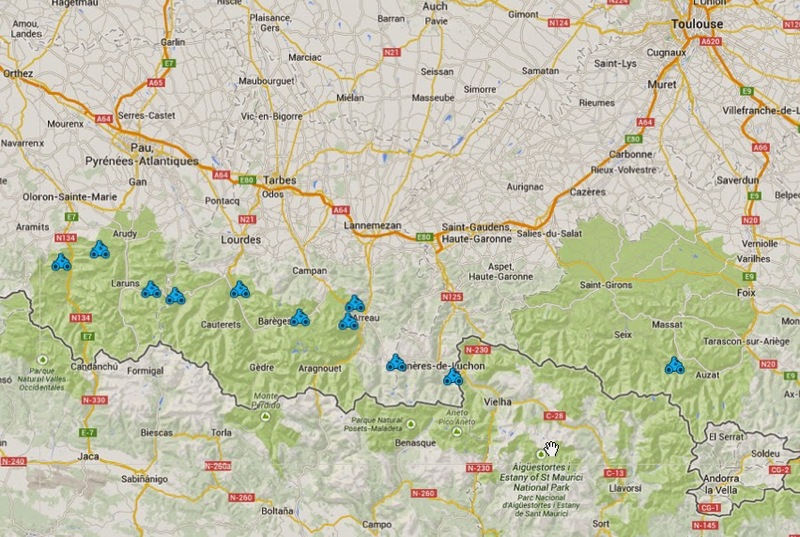 Velopeloton offers a page of climb descriptions in the Pyrenees). This is an easy area to get a good map and ride your own rides, there are plenty of places to grab water or settle in at a cafe. The Pierre-Saint-Martin ski station climb has only been included in the Tour de France once before, in 2007 (descent). The climb is a long way from nowhere, but a stones throw from Spain, and all but abandoned in summer. I rode the 25.8km long climb alone in 2010 - it is really steep. Cycling Weekly states the climb is a maximum gradient of 15% and the photo I took of a sign on the climb in 2010 (above) collaborates their story. Arette is the nearest real town (for water and cafes). 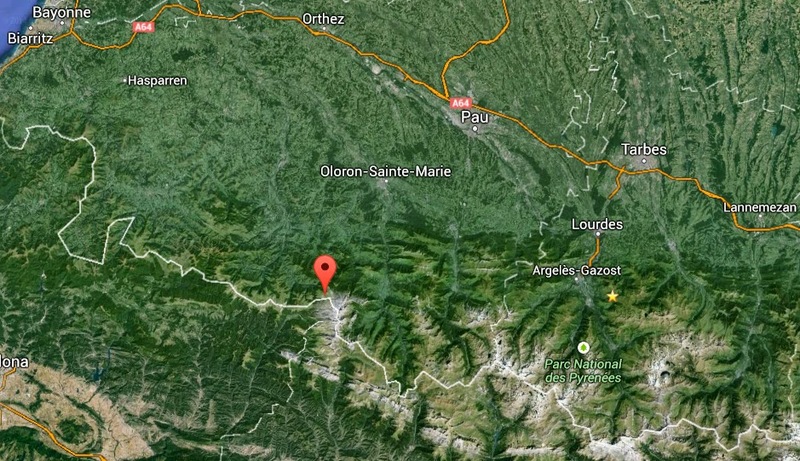 Location of Col de la Pierre St Martin in the Pyrenees. The TDF rarely goes this far west in the mountain chain. Stage 12 is a test of recovery because this is a long steady day of climb after climb in the saddle. We should know a lot about the overall GC after the finish on Plateau de Beille (15.8km at 7.9 percent). Stages 13, 14, 15 and 16 basically move the peloton east and north into the Alps, with Stage 13 running through the beautiful Gorges du Tarn. This is the time when you can sneak away and go climb Mont Ventoux on your way north to the Col du Galibier and Alpe d'Huez. (Read more Pedal Dancer: Traveling to Mont Ventoux or Pedal Dancer: Provence). Rest Day #2 in Gap/Digne-les-Bains - four relatively short but hard days of climbing await the peloton so there will be no true resting for the riders on this day, They will need to get out and spin, which means you can catch sight of them on local roads. Stage 17 - what is surprising is that this is only the fourth time that St-Jean-de-Maurienne has been a host city of the Tour de France. Amazing because most cyclists who have cycled in the Alps have passed through this working-class gateway city. Certainly not a tourist heaven, still I once had a very memorable meal in this town. 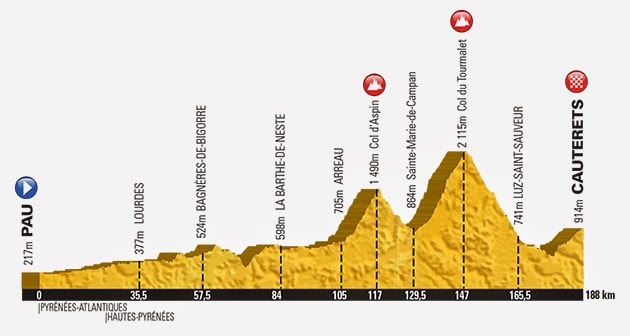 Don't ignore this stage, there is a lot to going on and it sets the mood for the final week of Le Tour. 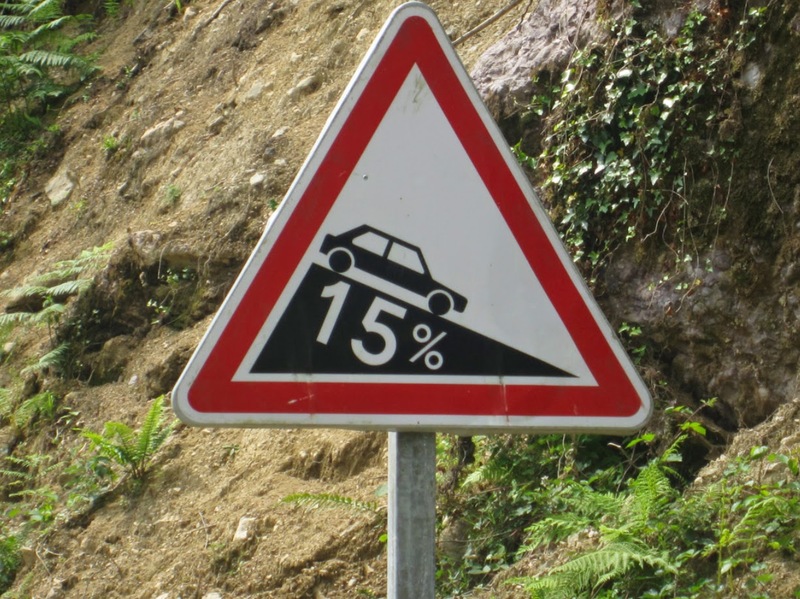 If you were to travel to the Alps for Stages 17, 18, 19 or 20. 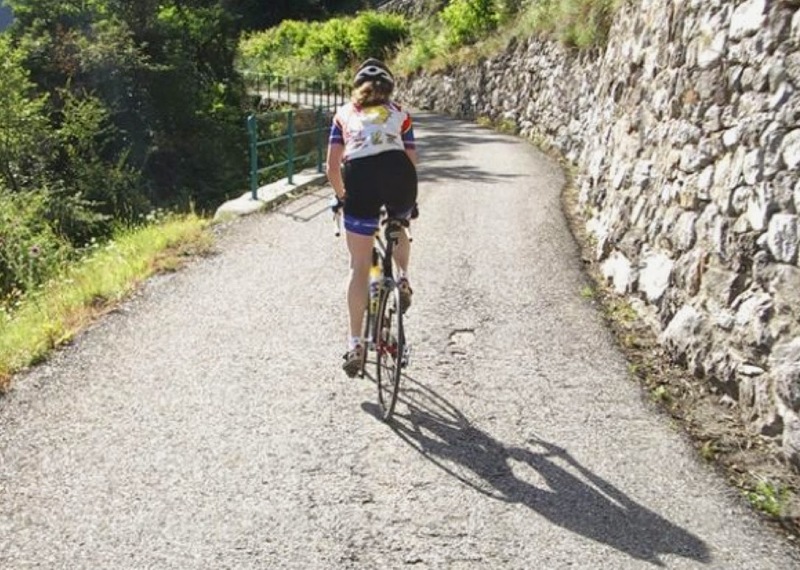 Be sure to allow days to climb the other famous climbs in the area on your own bike. As you can see on this map of the climbs in the Alps by Cycling Challenge - you could keep busy for days riding a bike in the French Alps. 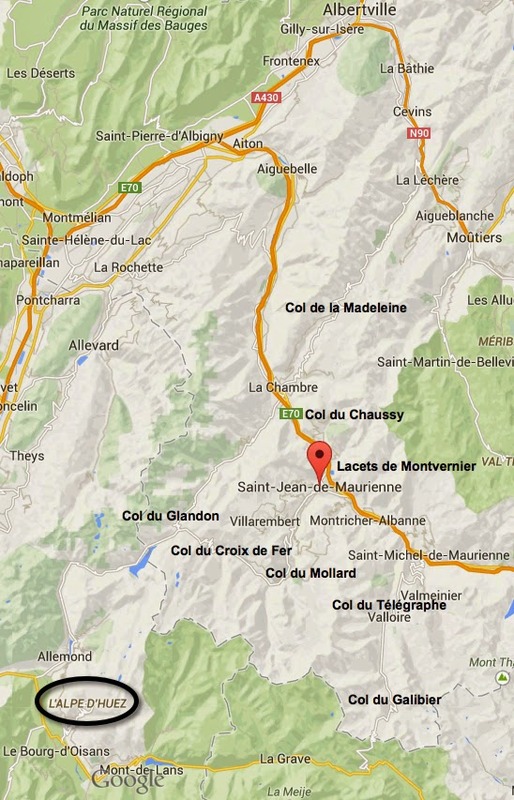 Stage 18 includes the whimsical 18-hairpin climb of the Lacets de Montvernier for the first time. 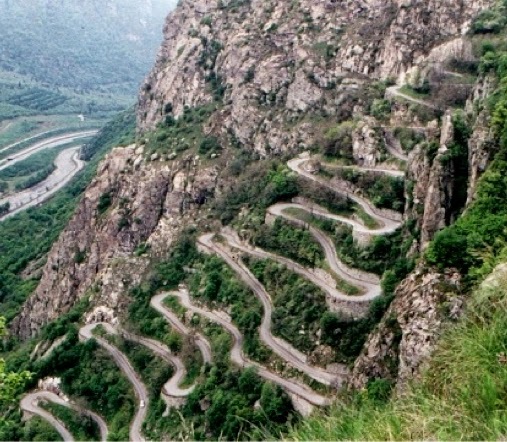 I did this climb (without the preceding 180km) way back in 2007 after seeing a photo of the switchbacks and researching where they were located. Lots of fun, I cannot imagine the caravan or team cars driving up this tiny hillside but am looking forward to the spectacle. This is me climbing the Lacets de Montvernier 7 years ago. Very narrow but roller coaster fun. 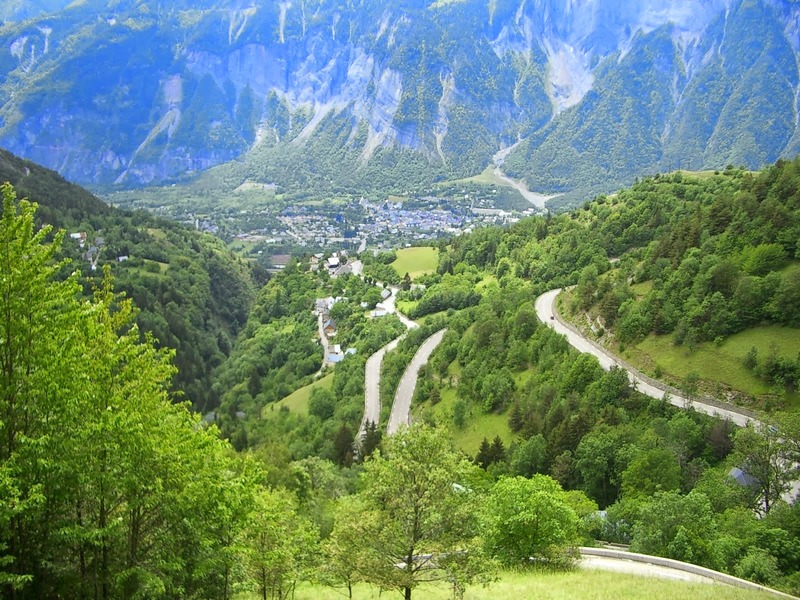 Stage 21 - there is a long transport back to Paris after the peloton climbs Alpe' d'Huez. No wonder Stage 20 is relatively short - Paris is a long way away and the peloton needs to roll onto the cobbles of Champs-Élysées the very day by 5:30pm. 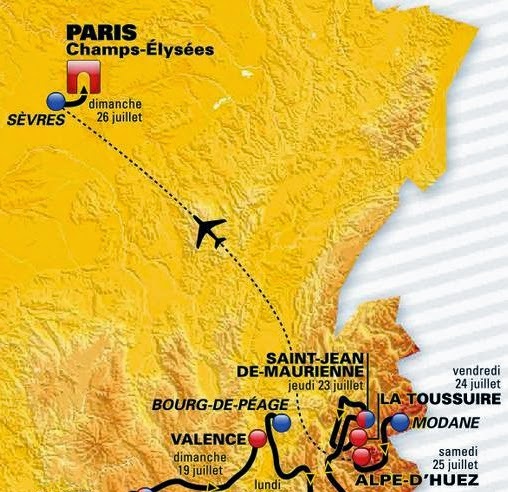 There will be many buses and trucks driving overnight to arrive in Sèvres or in Paris to set up for the final Stage 21. Fly to The Netherlands for the start, be sure to arrive a couple days early to watch the teams training, mechanics in preparation, or the team presentation. 1-week+ vacation to Belgium, Brittany and Normandy to see parts of Stages 3, 4, 5, 6, 7, 8, and 9 plus visit Bruges, the battlefields of WWI and WWII, Normandy and Mont-Sainte-Michelle. 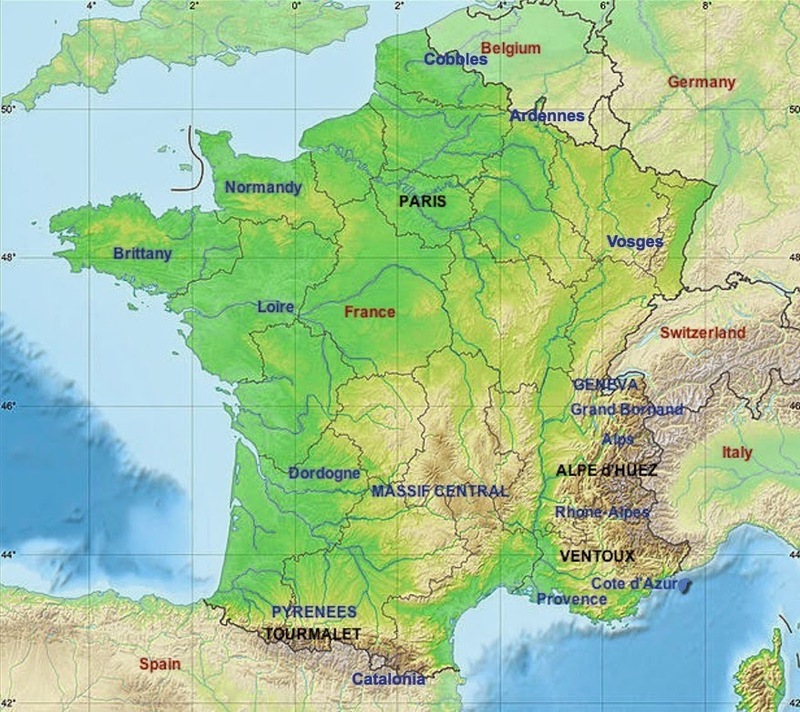 2-week vacation in Normandy, Brittany and the Pyrenees including Stages 8, 9 and 10, 11 (possibly 12). Plan a half tourist, half TDF vacation. 1-week of cycling in the Pyrenees taking in Stages 10 and 11 or 12 in Week Two, and then biking or hiking the remaining days on your own. 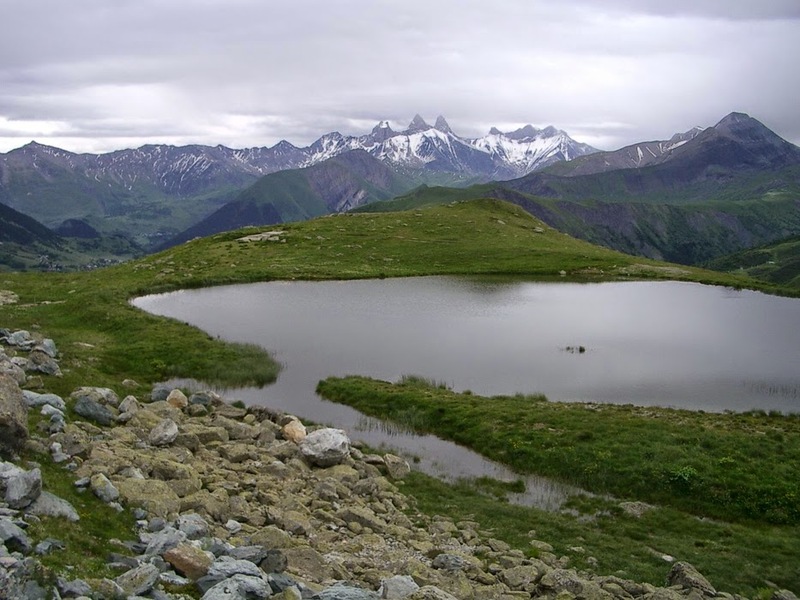 The Alps: pick and choose your stages and exit-routes in Week Three. If you do a self-planned vacation, consider camping, or going early or staying after the key stages to do your own riding. To see all of Week One while riding parts of the stages on your bike (Stages 1-9), a tour company might be best simply because transportation/lodging logistics will be challenging with a lot of ground covered and big crowds. This is a week where paying for expertise is smart. Ride and watch the stages in the Alps. Accommodations are difficult for the solo-traveler of 1-4 persons, plus big highways separate these stage starts and finishes, which means chasing the Tour daily could prove exhausting. Any time you intend to see a summit finish, or ride your bike 60+km to a stage - expect long days. I would recommend seeing the finish in Paris only if you happen to be in town anyway (or win a contest package). Paris is a long way from the top of Alpe d'Huez! Alternatively those who live in neighboring countries could make a nice 3-day journey to Paris. You do not need to ride a bike to enjoy seeing the Tour de France, however France (and Belgium) have outstanding opportunities for bike riding. Even if you do not haul your own bike along with you, try to rent a bike at some point along your journey. You will be able to enjoy the first week of the Tour through use of a rental car. 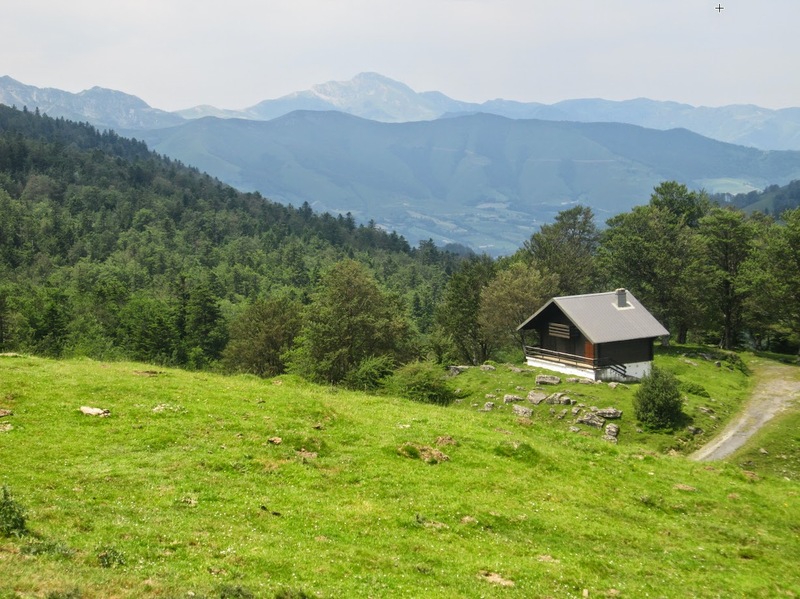 The second week, you will probably want to have a bike for some of the days, especially for your own private rides - there are bike rental shops in the Pyrenees. During week three in the Alps, I would definitely recommend riding a bike to and from the stages. On a number of the big mountain passes you will need to get a car in place the day before or walk for many many miles on race day. Quite honestly, that is why I recommend joining a bike tour company for the stages in the Alps. The better companies have learned NOT to chase the Tour every day and instead balance your conquests with the peloton's conquests. Sunday, July 21, Stage 21 - because it's tradition in a year of "breaking tradition"
*The winds on Stage 2 to Zélande could also prove interesting for the GC standings. 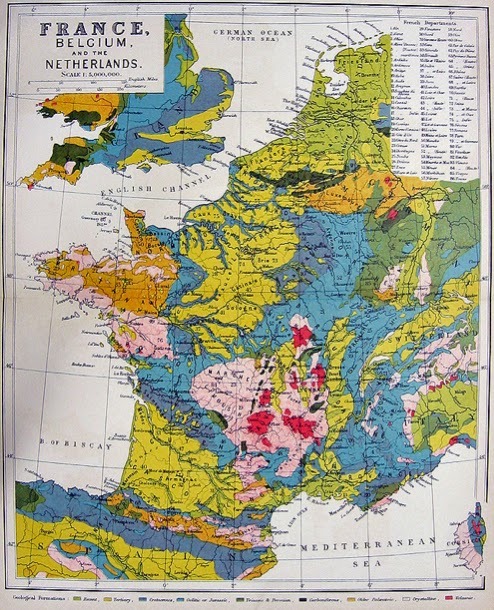 An 1882 map of France, Belgium, Netherlands. Perfect territory to ride a bike. New for 2015 - Points classification: bonus for victory! A new points distribution system will be implemented on the 9 flat stages of the 2015 Tour de France to give more importance to stage victories. New points distribution on "flat" stages: 50, 30, 20, 18, 16, 14, 12, 10, 8, 7, 6, 5, 4, 3, 2 points for the first 15 riders completing the stage. Former points distribution: 45, 35, 30, 26, 22, 20, 18, 16, 14, 12, 10, 8, 6, 4, 2 for the first 15 riders completing the stage. 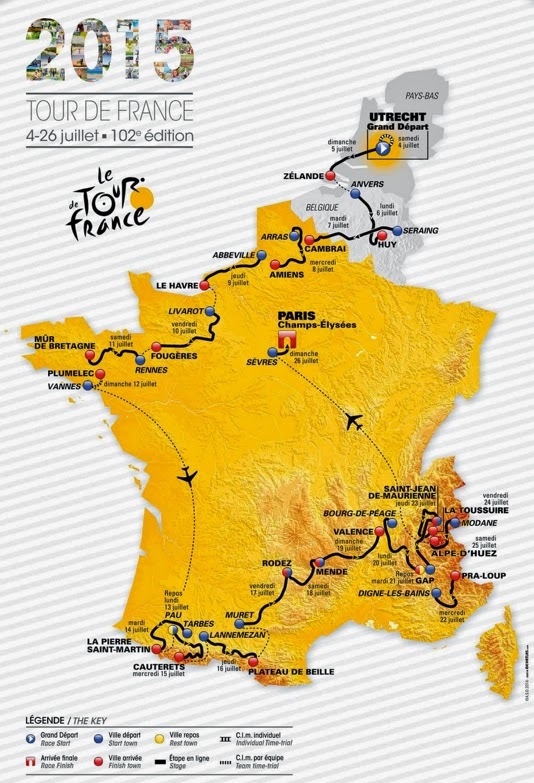 For all those who waited until today to learn about the route of the 2015 TDF - next year remember you can know all this ahead of time by following the Tour de France route rumors at VeloWire and VeloPeloton. You can count on Thomas and Paddy to begin listing rumors for the 2016 route, oh, any day now.